Today I would like to share a tutorial how to make this watercolor card using watercolor pencils and stamping. I made a short video of pictures how to create the watercolor circles that you also can use the same technique to make balloons or any image that you draw with watercolor pencils and add some water to give the watercolor effect. When the watercolor image is completely dry, you can stamp your sentiment. For this card, I wanted the sentiment also looks watercolor-y 🙂 It’s very easy to do. First, you cover your image or sentiment with ink and then spray with some water. The amount of water on the inked image or sentiment will give you the watercolor effect when you stamp it on the cardstock or watercolor paper. I hope you will give it a try and share with me your project 🙂 If you have any questions, feel free to ask in the comment box. THANK YOU for stopping by today and have a fabulous day! One more day to the end of February. Wow… time surely flies so fast when we have so much work and fun 🙂 I hope that you have been having great times this month with your families and friends. This is the gift bag. Instead of putting the card inside the bag, I made a card holder for the front of the bag. The birthday card is also the tag. Cut a piece of cardstock, make sure it is wider than your card. Then cut in the middle of the piece of cardstock slightly wider than the card for the insert hole. Final step is adding to the front of the bag using either double-sided tape or strong glue. I would recommend double-sided tape or Liquid Glass. I was thinking it would be nice for not only just plain rectangle piece of cardstock, so I punched the border of the card holder using Martha Stewart lace border punch. The card I made using CTMH February Stamp of the Month, A Happy Hello. And the Exclusive Inks Stamp Pads I use are Pixie, Smoothie, Sorbet, Goldrush and Topiary. I finished the card with some Sparkles Clear Assortment. They are back-adhesived clear gems, ready to use at anytime, no glue needed. For the gift box, I used My Creations™ Journaling Cards Box. I embossed a piece of Chocolate cardstock with Woodgrain embossing folder using my WRMK Evolution Advance. I made a template of the shapes I need for the box sides using a plain printer paper. And then using them, I cut the embossed cardstock for front, back and both sides of the box. Using some Liquid Glass, I added them on the box. And I stamped the sentiment from Thankful Heart stamp set using Rock-n-Roll technique. The Exclusive Inks Stamp Pads I use are Chocolate and Goldrush. For the leaves from the same set, I stamped the leaves with VersaMark ink pad on a piece of watercolor paper, added some Ranger Princess Gold embossing powder, heat set it with Craft Heater and then adding some colors I picked up with aqua brush from the lid of these Exclusive Inks Stamp Pads (Chocolate, Goldrush and Olive). Cut the leaves and added them on the box using Liquid Glass and Glue Dots. And I finished the box with some Durables Triangle studs and some Gold Sequin Assortment. TWO MORE DAYS you can take advantage to get these Special Promotions for February 2015 and save money on crafting supplies! First, this gorgeous coated canvas albums! When you purchase one of Close To My Heart’s alluring coated canvas albums you will be eligible to receive a second album of your choice at half price. That is a savings of over $17 USD / $19 CAD! Found this very cute & simple tutorial from CTMH Instagram (follow them @ctmhcorp) for the Make It Monday. To see the original video, you can see it Here. You can use this cute bow tie as embellishment for your scrapbooking, cards, or even make a cute hairclip for little girls. Fold both ends of ribbon toward the center, slightly overlap them. Staple it in the middle. Wrap the shimmer trim around the center, slightly puckering the ribbon in the middle. 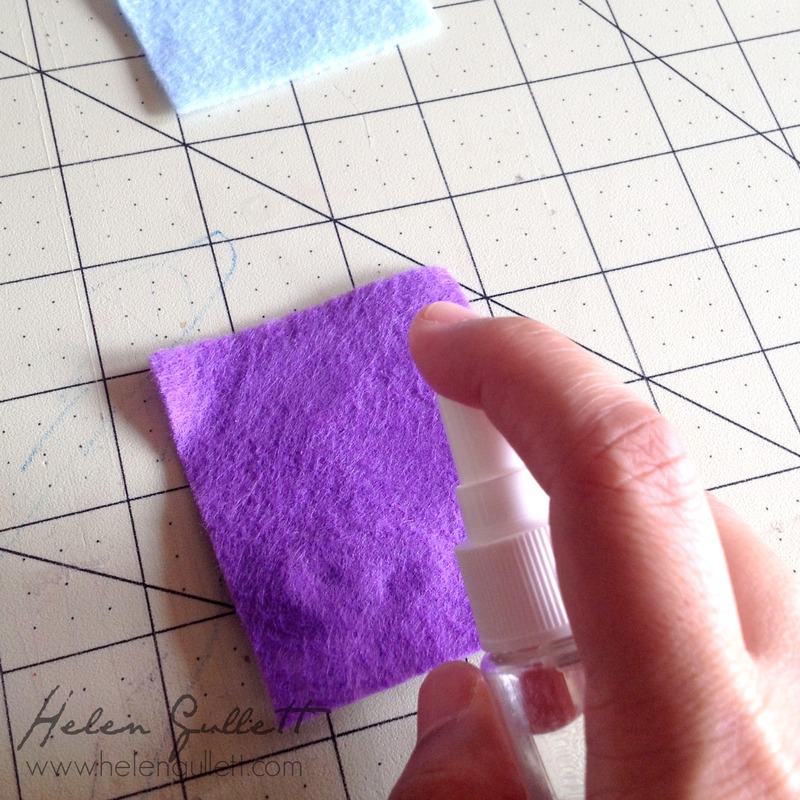 Use Micro Glue Dots to adhere the ends of the shimmer trim for added stability. I still have LOTS of felt leftover from our craft making party last year and why not using felt and hand stitching, I talked to myself. And there went I tried. 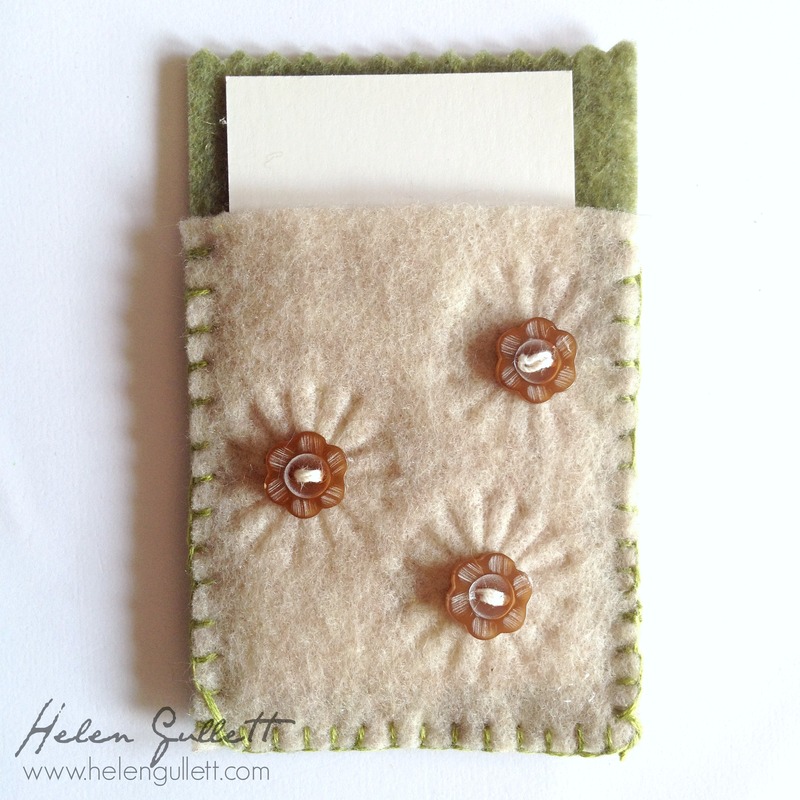 Adapting from this sewing tutorial, I made single card wallet/holder with felt. And I wanted some textures on my felt, not just plain felts. 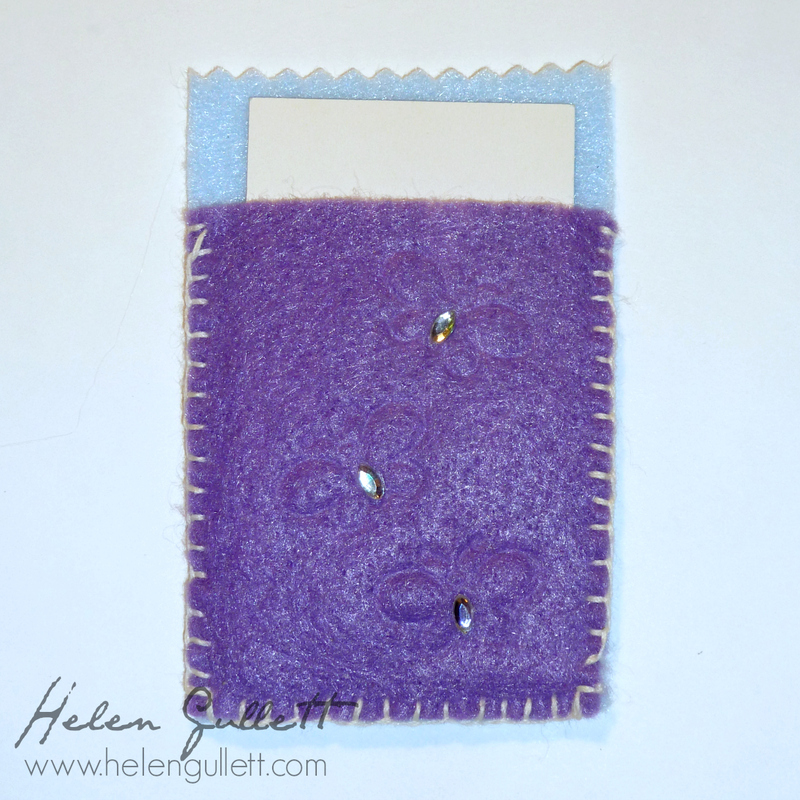 I remembered this embossed felt tutorial from Becky Fleck and decided to try when I made these business card wallet. my ruler is too long for this picture… sorry. 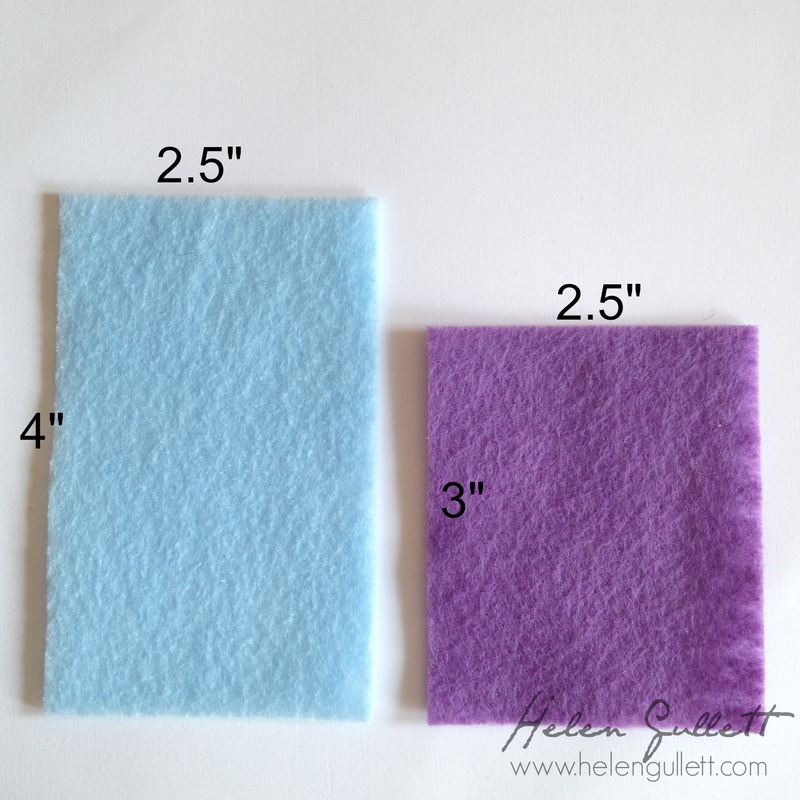 You will need 1 of 4″ x 2.5″ rectangle and 1 of 3″ x 2″5 rectangle. 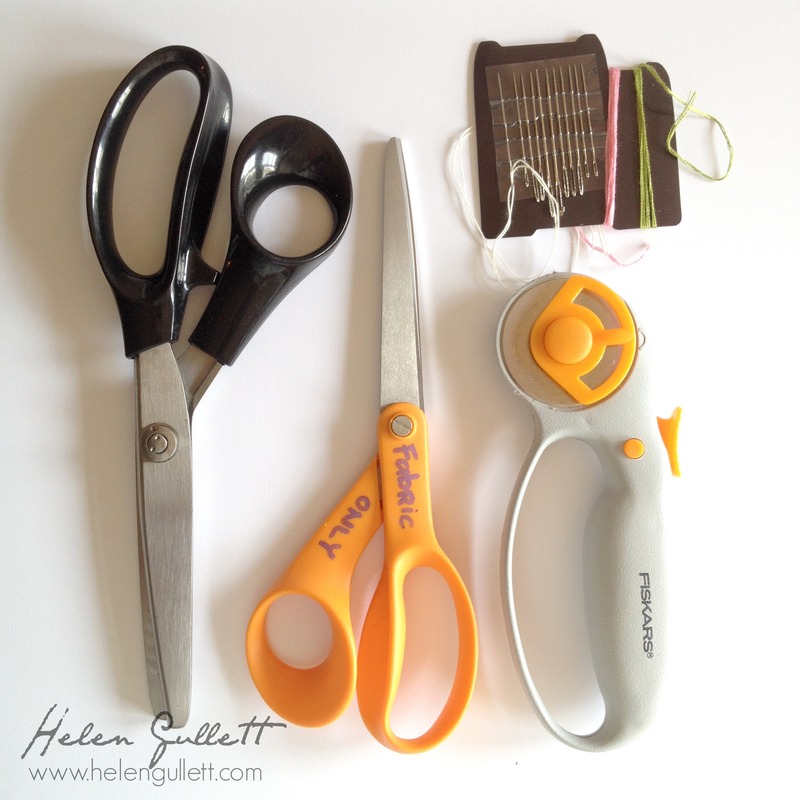 I cut my felt using my rotary cutter and quilt ruler, quick and easier than using regular scissors. 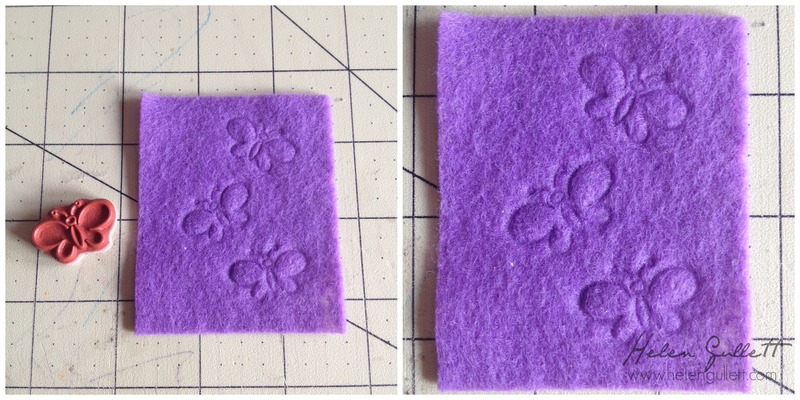 Lay the felt on top of the stamp that you want to use. 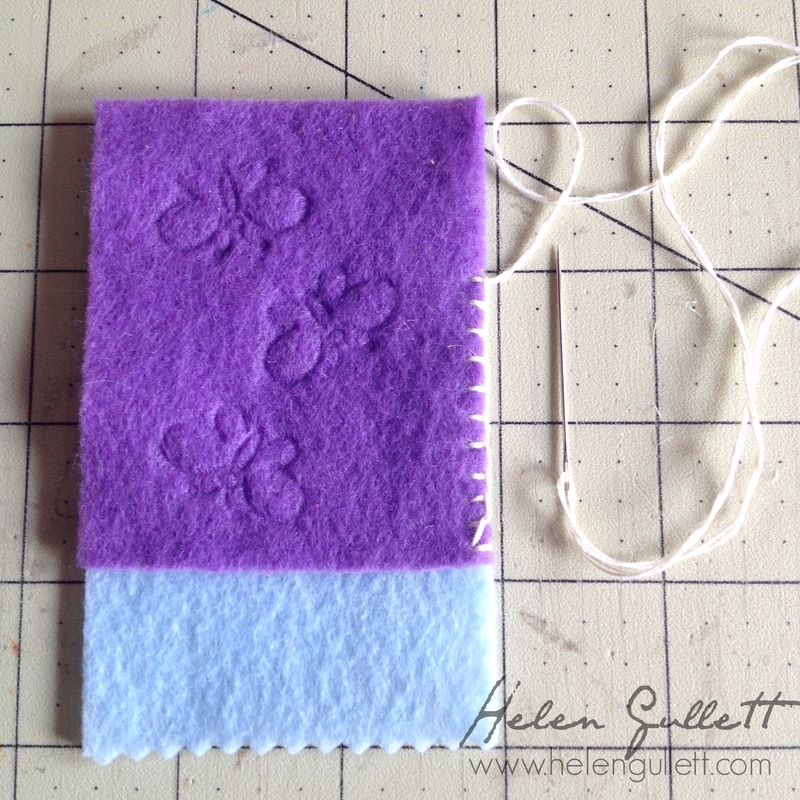 For this first one, I laid my smaller felt on top of one of the butterfly rubber stamp from Denami Design – Fancy Flutters stamp set and using my spray bottle I sprayed the felt lighty with water. 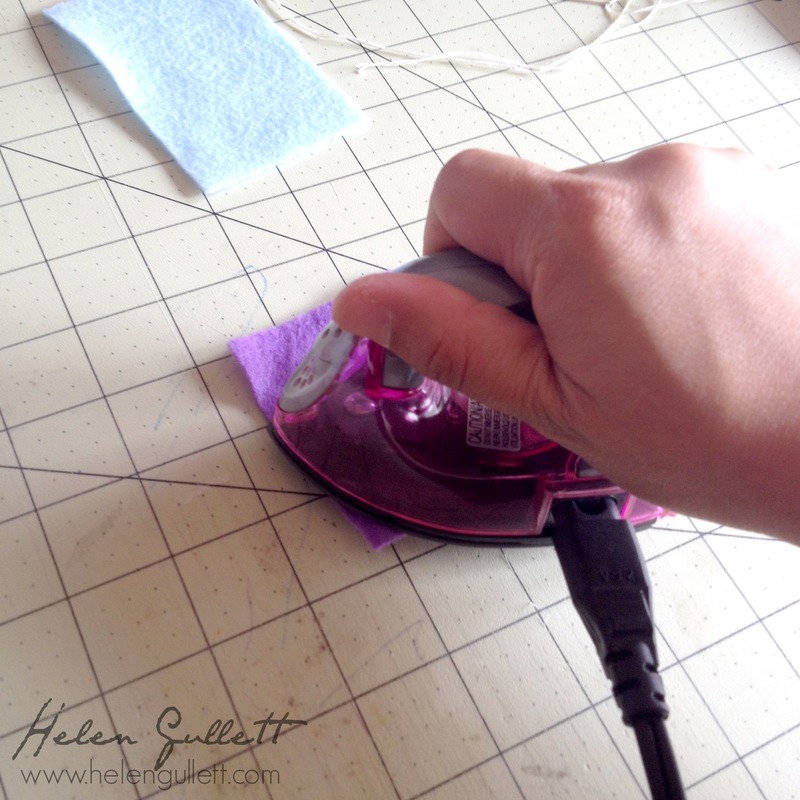 The iron I used is a tiny one I found at Walmart (or you can find at any craft store). It is not too hot for craft projects. So, I press the felt on the rubber stamp with my iron for about 15 seconds. Don’t be too long. But if the impression is not what you want, you can press again for another 10-15 seconds. Then last step is to put them together. Lay both felt on top of each other and stitch. I used blanket stitching to make the pocket. 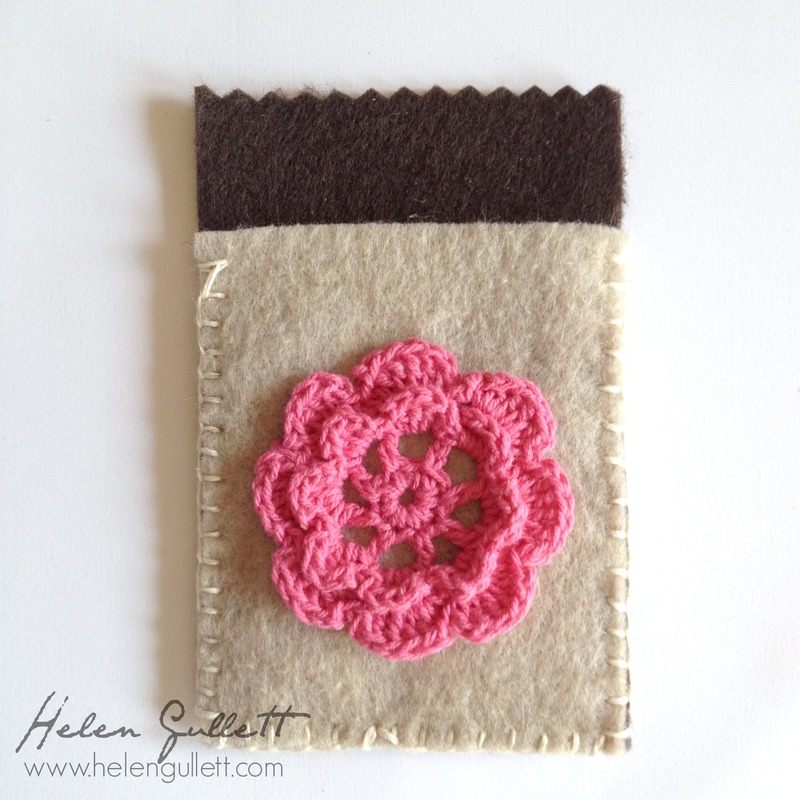 You can use the pinking shears before or after the stitching together for the decorated border top. Here’s another one I made using one of the rubber stamp from Taylored Expressions – Sky’s the Limit stamp set. So that’s the simple project I made for my conference roommates 🙂 Thank you for visiting my blog today! Have a fun crafty day!